Exploring the intersection of design, research and technology. Thesis week talk about the project at NYU. Sensor data driving the 3D model generated. User readings being recorded with sensors on a chair. Pressure distribution data among different pressure points. Algorithmically generated chair for a particular user. This project is an experiment on how physical products can learn from its users, to adapt and evolve its form to better serve them. 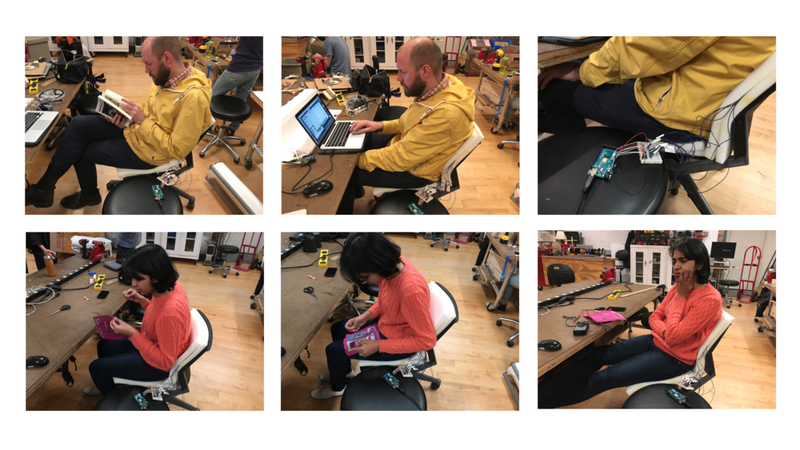 This is explored in the context of work chair design - how a user sits is evaluated (using sensor data) with data analysis/machine learning and a design of the chair is algorithmically generated based on this analysis. The generated form slowly evolves real-time as the system learns more from the user. When materials that change shape are widely available, this method could be used to adapt and evolve the form of the chair with time/use. Imagine a work chair of the future that is uniquely yours and gets better by learning from you! Tools: Machine learning, data analysis, Grasshopper, Rhinoceros, Arduino, R.
Copyright © 2017 Karthik Patanjali.